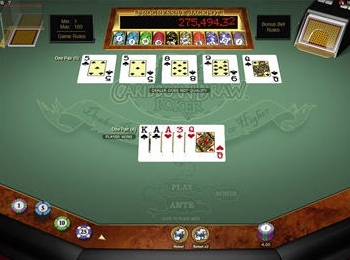 A fabulous new progressive draw poker game, Caribbean Draw Poker has been added to the Gold Series of table games at Microgaming Online Casinos. The game is a 5-card Draw Poker variant with one standard 52-card deck in which you compete against the dealer. There's a main five-card draw game offering an optional bonus side bet that can be played simultaneously, based on your initial poker hand. It is a game of luck and strategy that offers high payouts and a big progressive jackpot for added online poker excitement. How to Play Caribbean Draw Poker? First, you place an Ante bet on the poker table. The Ante bet may be anywhere from 1 to 100 credits ($, €, £, SEK...). Then click the Deal button to receive 5 cards, all face up, and the dealer will receive 5 cards, one face up and four face down. Now you can Fold, Stand, or Draw. If you fold, you lose your Ante bet and the game is over. If you stand or draw, an additional bet, equal to double your Ante, is placed in the Play area of the table. If you stand, you stay with initial 5 cards you were dealt; if you draw, you may trade in one or two of your cards in hopes of bettering your hand. Before the cards are dealt, you may place an optional Bonus side bet of one credit (fixed $1, €1, £1) in addition to your Ante bet. The Bonus bet qualifies you to win the big progressive jackpot and some other bonus payouts.